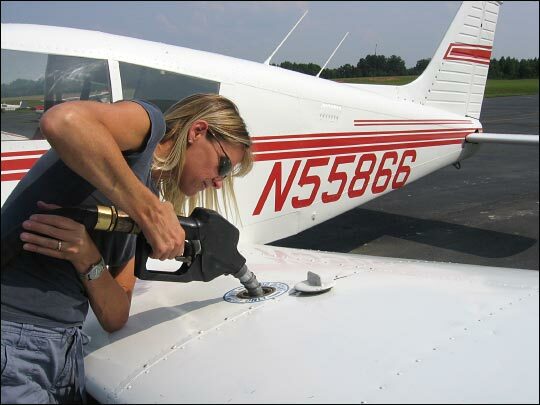 Dr. Catherine Cavagnaro, chairman of the math and computer science departments at the University of the South, Sewanee, fills the tank of her 1973 Piper Cherokee. You don't necessarily need to hit the road to spend $100 in gas -- and if you take to the air, you'd be surprised just how far you can go. Tennessee, for example, borders eight states, and that much gas could probably take you as far south as Jackson, Miss., or as far east as Charleston, S.C.
A C-note is just enough for a day's flight to any number of regional airport diners in the Nashville area. But to be completely honest, I have never been in a little plane before. Everything I know about flying involves long security lines, minimal leg room and stingy snacks. That's where Catherine Cavagnaro comes in. Dr. Catherine Cavagnaro is chairman of the math and computer science departments at the University of the South, Sewanee, and an avid flyer. She took me along on a flight to find a $100 burger in her 1973 Piper Cherokee 140, a single-engine plane she calls Sally. Cavagnaro, as it turns out, is willing to jump on any excuse to fly for fun. She has flown all across Tennessee in search of the perfect bagel, and even flies cross-country for groceries. We touch down at Winder/Barrows Airport in Georgia, and park the plane just a few feet from the doors of the Spitfire Deli. Celia Lockwood, the owner and chef, is ready and waiting to judge our landing. Lockwood is a British immigrant and former flight attendant, who’s turned the airport’s old lounge into a shrine for the World War II fighter jet it’s named after. Even the burgers are named for planes, like the Whirlwind, the Gladiator and the Hawker. I'm more than half way through my P-51 Mustang cheeseburger before I realize that inhaling half a pound of Angus beef might not be a good idea -- Cavagnaro is an aerobatics pilot.